Last night i was sitting talking to Martines in the fishing harbour, asking him if he thought it would be possible to go out fishing in one of the boats. He said it was rare that girls go fishing here and that the fuel is expensive but that he would ask two of his friends that were really nice. I crossed my fingers because I was so interested to go. And they said yes! So in the morning i packed my bag and went with Martines to the fishing boats. There was a lot of things going on, people moving, takling and shouting. I was very curious to see who they were. I had decided that if I did not get a good feeling I would not go. When I met Ranking and KT i got a very good feeling – a really good vibe! KT pointed out on the water and said; ”Hey, look a rainbow! Means it is going to be a good day!” Of course, he was right! The boat, Anointed, was a fast open motorboat, sky blue on the outside and pink on the inside, filled with big hooks, thick lines, a cooling box with baitfish and food for lunch. When we left the harbour they lit a splif each and prayed for the day before setting out to sea. They are professionals, using landmarks to navigate to the good spot and other signs to see where the fish is, like birds etc. It was so impressing to see the years of knowledge and experience making what should be so difficult look so easy. Ranking is the captain of the boat, always keeping the balance and speed perfect (really cool and always smiling!). KT is the watcher and it is also he who pulls the fish to the boat, a very tough job. We went far out to sea, always dragging lines behind to catch Mai Mais. All lines are pulled by hand. 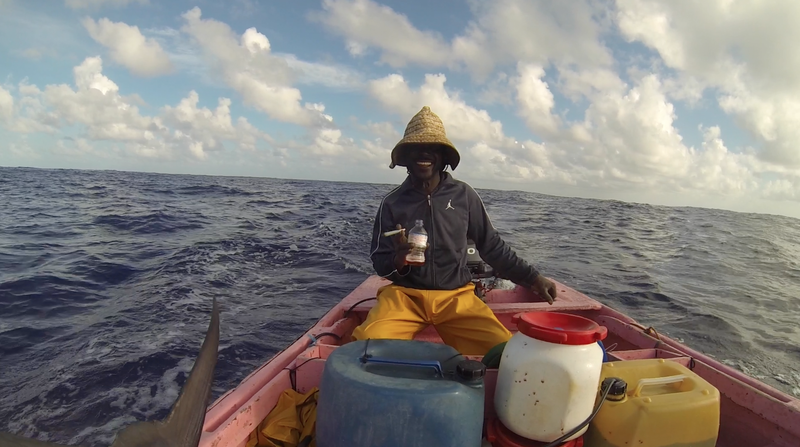 When we got out they set the Marlin boys with live tuna. A big marlin striked one of them and a battle between fish and man began that lasted for almost an hour, with KT pulling the line, letting go and pulling again as the fish fought for its life. I was not so scared until I saw the enormous fish jump out of the water infront of the boat and started pulling us against the wind, with KT holding on to the line. 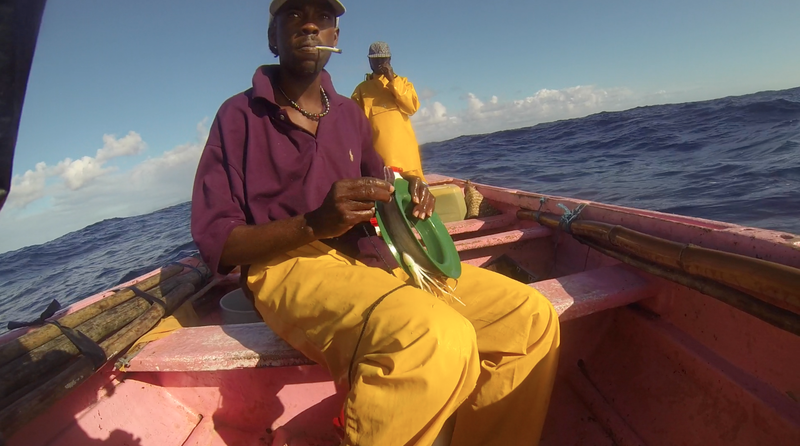 As the fish got closer to the boat Ranking harpooned it and killed it quickly with one blow of the machete. There was so much blood! The blue marlin was beautiful and it felt strange to see such a big body dead. I do not support sport fishing these fish but this is something different. Their fathers have fished when they were fishermen as they fish marlin today. It is their job, and they are professionals. High five! The battle between man and fish is over. If the fishermen of Saint Lucia would fish anywhere else in the world, they would still be better. They are more raw, using small boats and bare hands, not so much technology. These are strong men! Afterwards we had meat from the marlin for dinner on Tootiki with the original Tootiki-crew, KT, Ranking, fat Bread (their fishing partner) and Martines. KT is not only one of the two the best fisherman I have ever seen (Ranking is the other!) but also an excellent cook! We had a real feast and a really good time, so happy to have met such wonderful and inspiring new friends! Red yellow and green, the strongest colours of the rainbow. Posted 4 years ago by vindburen. 6/2-2015 – Missing Union Island already!